Quick plug for a friend’s kickstarter project – Ren season 1. If you enjoyed the Lord of the Rings, the Hobbit, and that sort of genre of film, check out the link below as well as some of Kate’s previous film projects, such as Born of Hope. Well worth supporting! Leg 50 proved to be a longer day mileage wise, helped by the fact it was considerably flatter than recent days – 87 miles covered in total, getting me a long way further south. Light rain on the tent didn’t bode particularly well for the day when I awoke, so I stayed inside for a bit waiting for it to stop. It did eventually and the sun came out, so I rolled out of my tent, getting a bit tangled up with my sleeping bag in my haste, but finally managing to extricate myself along with several other bits of kit in the process. I stuffed down a breakfast of leftovers including pitta bread, houmous, a banana, and smoked sausage, a bit of a weird combination but I reckoned it would keep me going for a bit. I would however need to restock soon. Before having a shower I gave my bike the once over, not quite satisfied I’d got my spokes quite right last night, but they seemed okay – think I was just getting paranoid over my rear wheel. Nothing was rubbing so I left it alone. I was finally ready to hit the road by 11.00, and rode back down the hill to Largs stopping at one of the sweet shops to get some energy boosts for the day ahead; they’d tweeted me so I felt obliged to respond…oh the power of targeted marketing. With the sun out and the isle of Great Cumbrae just off the coast, I pedalled south through Fairlie down the A78. The road was reasonably flat and straight for a change, but a little bit dull compared with previous weeks, and the traffic was also heavier again with lots of cars and lorries steaming along in both directions. Everyone always seems in a hurry to get past a cyclist, and whist I realise they have work to get to etc is waiting an extra 30 seconds to pass safely really going to make that much of a difference. Still, the drivers were still relatively patient compared with those further south. I got my head down and passed West Kilbride, before tackling Ardrossan, Saltcoats and Stevenston, which all merged into one another and weren’t very remarkable. You can get the ferry from Ardrossan over to Arran or Campbeltown. I’d been tempted by Arran but had been in Scotland since 10 May and figured I really ought to make some longitudinal progress. There was also the risk of me going native if I stayed much longer! Skirting around several golf courses I made it to Irvine, riding through the town and on to Troon avoiding the busy dual carriageway. I stopped in Troon for a break, grabbing a sandwich and slice of pizza from a bakers, as well as a birthday card for my brother which was duly dispatched. His present will have to wait until I get home, but rest assured the garden gnome is coming! The next bit was a tad convoluted as I pedalled around to Monkton, followed by Prestwick, past yet more golf courses and an airport, before arriving in Ayr. I didn’t pause in Ayr, although if I’d been there a few days later I could have met up with Esko from Finland who has been following my blog, and has dropped me a few emails; thanks for the support Esko, will have to cycle to Finland to meet up instead, I’ll add it to my list of destinations. The route got a bit more interesting and scenic post Ayr, and I stopped in Alloway to look at the birthplace of Robert Burns, celebrated Scottish poet. I hadn’t realised he died so young. There’s a museum you can visit, but I contented myself with a walk around the gardens and memorial, as well as the Brig o’ Doon bridge. The late medieval bridge is pretty impressive, and the setting for another verse from Burns’ Tam o’ Shanter poem. Tam rides over the bridge to escape a witch, as apparently they can’t cross running water, which seems a little inconvenient as far as one’s toilet is concerned. After a deficit of pleasant countryside for the last few miles I seem to have taken quite a few photos in Alloway. Post a bit of a photo frenzy, and with the nice weather and countryside distracting me slightly after the morning’s urban sprawl, I took the wrong road out of Alloway. I ended up heading up the B7024 towards Maybole instead of taking the intended coastal route. I tried to correct my mistake a few times, but just ended up getting turned around and still finished up in Maybole. Never mind, it was still a pleasant route through forest and farmland, with a few hills to keep things interesting (and sweaty). I passed a couple of tourers going the other way who gave me a wave which I duly returned. They looked more loaded than me and were struggling slightly up the hill I was coasting down; I assured them they had a nice descent coming up. Unfortunately due to my wrong turning I missed an ‘electric brae’ that was marked on my map, which I’d have liked to see. For those who don’t know that’s a hill which plays a trick on the eye, so you think you’re going up when you’re in fact going down, and vice versa. I took the A77 from Maybole back to the coast, with a few accidental extra miles added on to my tally for the day. There were still lots of miles for me to get through, so I pressed on through Kirkoswald and past Tam o’ Shanter’s house, then pedalled through Turnberry and along the coast to Girvan. 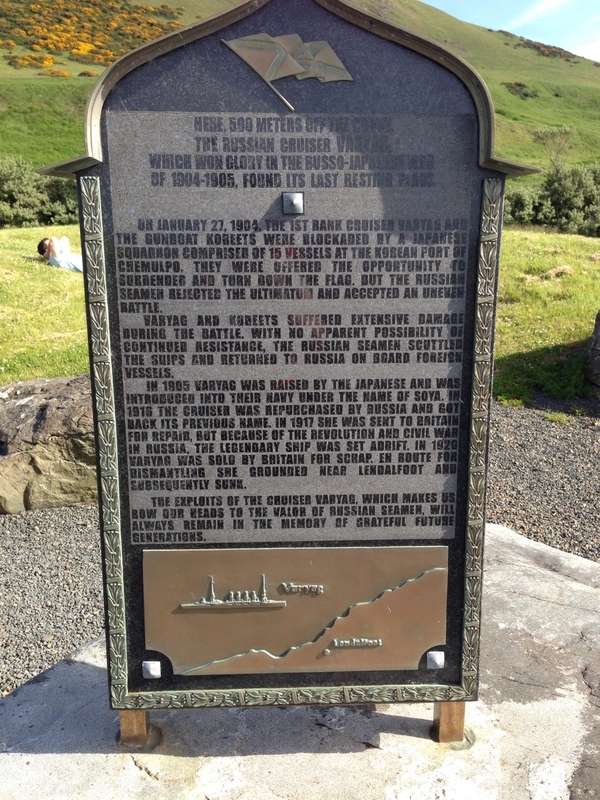 Just past Lendalfoot there’s a memorial to a Russian cruiser, the Varyag, which has an interesting history. I wasn’t expecting to find a memorial to Russian cruiser on the west coast of Scotland, which ran aground and sank just off Lendalfoot in 1925. In case you can’t read the info in the photo above, the Varyag was involved in the Russo-Japanese war, it’s crew refusing to surrender in the battle of Chemulpo Bay in 1905. She and one other Russian ship were blockaded in the Korean port by 15 Japanese ships, but refused to strike their colours when offered the opportunity. An unequal battle followed, with a heroic attack by the Varyag, however eventually both Russian ships were unable to offer continued resistance and their crews scuttled them, before returning to Russian aboard foreign vessels. The Japanese later raised the vessel and added it to their own navy as ‘the Soya’, before selling it back to Russia in 1916. The Russians sent it to Britain in 1917 for repairs, but then had a bit of a revolution and it was set adrift. From what I can gather we then nickedsalvaged it, before selling it for scrap, but it ran aground and sank on the way to be dismantled, a bit of an ignominious end for a ship with such a valiant history. A few longer hills followed as I rode around Bennane Head and through Ballantrae, with a long climb up to Smyrton and Auchencrosh which left me very hot. I realised my arms had burned slightly as my sun cream and worn off, probably hours before, whoops. The road surface was pretty shoddy in places which made for tough riding, and jarring my wrists which were really starting to ache, however I was rewarded with a nice long descent down to Loch Ryan. I made it round to Cairnryan, from where Stenaline ferries leave for Ireland now, instead of from Stranraer. The traffic was still relatively heavy so I hurried round to Stranraer, arriving about 19.00, and found the Aird Donald campsite. I had to interrupt the campsite owner during her soaps, however she was very accommodating and we had a quick chat. Apparently she doesn’t get as many tents as she used to, with the ferries having moved and more people in camper vans. It was only £8.00 a night, and my only company on the camping field were lots of rabbits. For some reason it felt a little spooky. Post setting up my tent I cycled into Stranraer on a considerably lighter bike, and had a quick tour around looking for somewhere to eat. In the end I decided upon a Chinese at the Sun Kai, as well as a couple of cold beers to celebrate a good day’s ride, and to cool off a bit. It proved to be a good choice, with lots of carb loading opportunities, and I also met Frank Montgomery (@tr6fom) a fellow cycle tourer. Frank, who lives in Leeds but is originally from Glasgow, had just completed a ride from Leeds to Glasgow in one day, covering over 200 miles, a pretty phenomenal effort. At 64 he’s just about to retire and has a lot of cycling plans. We chatted about touring ideas (Pyrenees sound very attractive) and experiences to date, with the restaurant girls chipping in with a few tips on the local area. A great evening and before I knew it 23.00 had arrived. Another day done I bid Frank goodbye, although I’d very likely bump into him tomorrow in Portpatrick, and headed back to the campsite. It was too late to start a blog entry at that point, however I made sure my written journal was up-to-date before I nodded off, slightly concerned my tent was being surrounded by rabbits intent on mischief. This entry was posted in Bike around Britain 2013 and tagged adventure, bicycle, bike, Bike around Britain, countryside, cycle, cycle touring, cycling, expedition, outdoors, Stranraer on July 30, 2013 by SelfPropelled. Cannot recommend the Pyrenee’s highly enough for a cycle tour. Back in ’97 I toured on a Tandem from Barcelona to Toulouse and back and it was unalloyed pleasure. The passes are high, but most of the gradients are long, gentle and steady. You’d want to be there early or late in the season to get a reasonable cycling temperature though. I always wonder how you decide where to pitch your tent when you have the place to yourself. After watching the Tour De France, anywhere in France looks fantastic for touring.